The CRS-MINI was developed to be portable and dependable, which allows for quick deployment of cable. This reel will handle cables for camera systems and sonar equipment as well as many other applications. 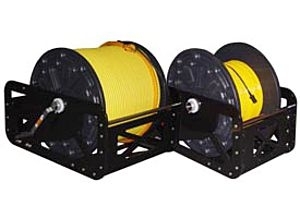 An umbilicus winch facilitates deployment and recovery of ROV tethers and umbilicals. Such a winch is a cylindrical, horizontal-shaft rotary device for winding in and paying out umbilical cable and tethers. Its cable storage drum usually is driven by an electric motor. Choice will depend on umbilicus length, diameter and elasticity, and the winch's size, power and drum storage capacity.